In many societies and for many families, the responsibility for looking after very young children during the day has passed from parents to third-party care providers, prompting a hotly contested debate about the merits of early childcare and how it affects childhood development. This column exploits an expansion of childcare provision in Germany to show that early childcare can be a major contributor to eliminating inequality of opportunity and even lay the foundations for a more productive workforce in the future. For several decades, in the US and in many other countries, there has been a significant increase in the proportion of mothers going to work. This trend has led to an increase in the provision of childcare, both private and state, to bridge the gap between birth and school. Much attention has focused on how best to provide and fund this childcare. Perhaps less attention, though, has been given to the impact of childcare on child development, particularly for the very youngest children attending. Yet, just as childcare provision has an immediate impact on economies by enabling mothers to become productive participants in the workforce, our research shows that the impact of early child care has profound implications for the workforce of the future. Policymakers have made efforts, with varying degrees of success, to increase the availability of early childcare, either by direct state intervention, market-driven solutions, or a mix of both. Consequently, in many societies and for many families, the responsibility for looking after very young children for long periods of time during the day has passed from parents to third-party care providers. This shift in the approach to childcare provision has prompted a hotly contested debate about the merits of early childcare and how it affects childhood development. For some, early childcarecan only be a poor substitute for the care provided by parents at home. Others believe that, for certain children at least and depending on their circumstances, early childcaremay offer real benefits over parental care provided at home. Existing research suggest that positive impact of early childcare may stretch well into later childhood years and adulthood (Heckman and Masterov 2007). Recent empirical evidence backs up this claim. For example, Norway expanded early childcare in the late 1960s and 1970s. Havnes and Mogstad (2017) look into how those children who came to benefit from early childcare fared on the labour market about 20 years later. They find that childcare had a small effect on average earnings, but significantly improved earnings below the median. These findings suggest that earlychild care can help level the playing field, stimulating child development more strongly among children who are normally behind in on the labour market. The impact of early childcare is likely to vary across children from different backgrounds. This is an issue which has not been given sufficient attention and is also one that is hard to tackle. Fortunately for our research purposes, the circumstances surrounding early childcare provision in Germany (and by early childcare we mean childcare offered to children under the age of three), coupled with unique data and specialised econometrics techniques, allowed us to gauge the comparative impact of early childcare (Felfe and Lalive 2018). We were able to separate out the impact on children depending on characteristics such as gender, migrant status, the educational attainment of parents, as well as the attitude of parents towards sending their children to early childcare. In Germany the provision of early childcare up to three years of age is delivered by state-run care centres and heavily subsidised by the government. There is a clear educational mission, with a focus on developing children's analytical, language, and motor skills, governed by strict guidelines. Centres are tightly regulated with regard to hours, group size, the staff-child ratio, and staff qualifications. The regulation and quality standardisation means that the quality of care provided is less likely to account for variations in child development performance. Legal entitlement to a place for all children aged one and over was only introduced in 2013. Prior to this, demand for early childcare places far exceeded supply, although the number of places available gradually increased following a federal government programme of expansion initiated in 2005. We studied aspects of childhood development performance for six cohorts of children attending care centres in the years 2003 to 2011 inclusive – a period of ‘modest’ expansion of early childcare attendance from 7% to 27%. In addition, we estimated findings for a projected simulated alternative of ‘progressive’ expansion from the current 27% to 50% attendance, in order to assess the implications of different policy approaches to the expansion of early childcare. Compulsory medical screening at six – during which pediatricians assess children's development with regard to language, motor, and socio-emotional skills – provides a reliable source of childhood development performance data. All three dimensions are predictors of social and economic success later in life, including educational achievement and labour market performance. The socio-emotional component is particularly interesting as it looks at issues such as behavioural problems, emotional instability, hyperactivity, and peer relationships, and it is not part of the educational mission for care centers, unlike language and motor skills. Figure 1 shows our estimates of the effects of early childcare on language skills, motor skill, and socio-emotional development. The first column of sub-figures shows the effects of a modest expansion from no childcare to one slot for every four children. The second column of figures shows the effects of a progressive expansion from one slot per four children to one slot per two children. Notes: This figure shows the effects of child care on children in two levels of child care offer. ‘Moderate’ is the level we currently see in Germany, with one place for every four children; the ‘progressive’ level offers a place to every two children. 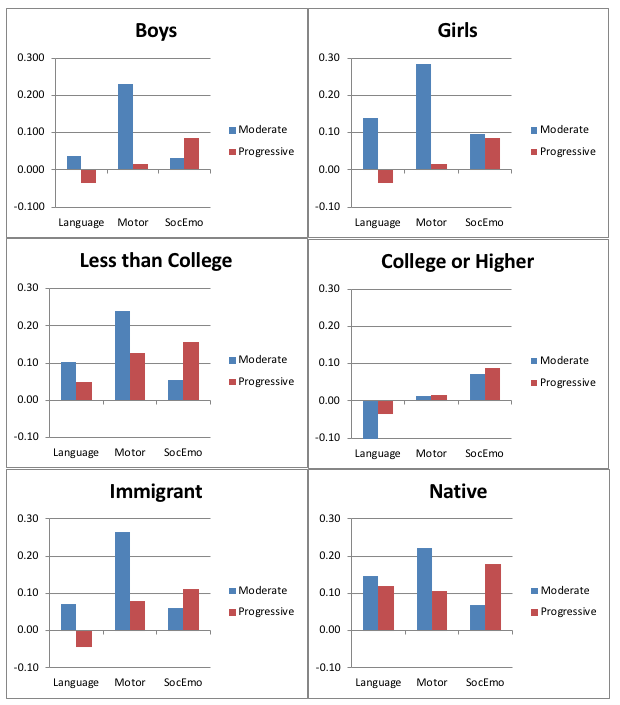 For language skills, the impact of early childcare under moderate reform conditions, while more modest, are still positive, with immigrant children gaining the most. As far as motor skills are concerned, all the children, regardless of the different characteristics considered, benefitted from attending the early childcarecenters. These are the findings under the moderate reform conditions, i.e. when attendance increased from 7% to 27%, which covers the average expansion rate during the period from 2009 to 2014 and the cohorts of children we studied. The socio-emotional component provides perhaps the most interesting results. The socio-emotional advantages from attending early childcareunder moderate reform conditions prove minimal for all the children, albeit slightly less so for boys. However, when we look at progressive expansion, this changes. Boys, children with less-educated parents, and immigrants all benefit significantly from early childcarewith respect to socio-emotional skills. Under modest reform conditions, and careplaces allocated on a first come, first served basis, the children that attend early childcare are inevitably those with parents that are the most determined to obtain a place for their child and that place the greatest value on early childcare. However, as the availability of places increases under progressive reform conditions, more children are able to attend regardless of the value their parents place on early child care. It is possible that the parents that are more likely to send their child to a care centre even when places are relatively scarce have a better understanding of what it takes to foster socio-emotional development (meeting other families regularly, visiting the local playground, mixing with other children, etc. ), and that they do would do this regardless of early childcare attendance. This would render the benefits for those that attend over those that stay at home relatively small. In contrast, the parents that are less likely to send their child to a care centre, but who do so when progressive expansion makes getting a place much easier, may not provide those social-emotional building experiences at home, and so their children benefit hugely by attending care centres. This is particularly true for boys, immigrants, and children from less-educated families. Our findings have important implications for policymakers regarding equality of opportunity for children from less advantaged backgrounds, improving the life chances of boys, and also with respect to maximising educational performance and the contribution of future generations to the economic prosperity of nations. In addition, they raise the issue of what measures to give weight to when assessing the benefits of early childcare. The findings also provide support for policymakers and politicians lobbying for more extensive provision of affordable, good-quality early childcare in countries that currently provide little. The evidence suggests that when there is good availability of early childcare, quality of provision is tightly regulated, and there is a focus on particular educational outcomes, certain groups of children benefit from attending childcare. Of course, whether or not this evidence in clear support of early childcare provision under certain conditions will be enough to settle the debate about the benefits of early childcare is another matter entirely. Authors’ note: An earlier version of this column appeared at ProMarket.org. Steve Coomber provided helpful editorial assistance. See also here for a summary of our findings. Havnes, T and M Mogstad (2014), “Is universal child care leveling the playing field?”, Journal of Public Economics 127: 100-114. Heckman, J J and D V Masterov (2007_, "The Productivity Argument for Investing in Young Children", Review of Agricultural Economics 29(3): 446-493. Felfe, C and R Lalive (2018), “Does Early Child Care Affect Children's Development?”, Journal of Public Economics, forthcoming.